My mother-in-law, Ruby, lives in southern Indiana in the town of Paoli. We spend family Christmas with her. Those good people in Paoli remember what Christmas is all about. Each year, just before Thanksgiving, Herb from the street department hauls the baby Jesus, his mommy and daddy, and an assortment of livestock and shepherds and wise men out of storage and sets them up on the courthouse lawn. The holy family takes up residence on the southwest corner of the square, and no one dares to complain. There are no civil libertarians in Paoli at Christmastime. But Christmas isn't official until Wilson Roberts decorates his variety store, which he does the day after Thanksgiving. Each year the same adornments—a cardboard cutout of Rudolph taped to the front window, a strand of tinsel hung over the checkout counter, and a bucket of candy canes left over from the year before sitting next to the cash register. On that day, at precisely 8:50 A.M., people from all over town head to the variety store to start their gift buying. It is a migration every bit as predictable as the Capistrano swallows. I stopped in a few years ago, looking for a nativity set. The week before, my wife had said, "What this house needs is a nativity set." So on the day after Thanksgiving, while everyone else was lying around in a turkey-filled stupor, I drove into town to the variety store. It's a small store in sore need of a liquidation sale. Wilson's motto is "We have it, if we can find it." Forty years of merchandise is stacked to the ceiling. It makes for some incongruent discoveries. I once found a poster of Michael Jackson next to a 1959 edition of The Old Farmer's Almanac. I went inside and sought out Wilson Roberts. He was sitting in the back of the store, smoking a cigar, his ashes dribbling on the wood floor. "I'd like to buy a nativity set," I told him. He said, "Well, I know we have one, if I can just find it." He began to look. He looked over by the hair nets and bobby pins. Not there. He looked by the garden hoses. Not there. Then over by the yard goods and notions. No holy family there, either. He looked over near the lawn chairs, then underneath the candy display, which is where he found it. He dusted off the box, opened it, and took a roll call. One manger, one kneeling mother, one proud father, some shepherds, three wise men, one sheep, one cow, one donkey, and one baby Jesus. Everyone present and accounted for. "That'll be twelve dollars," he told me. "How about ten?" I countered. The box was torn, and the cow was missing an ear. Wilson Roberts squinted at me, shifted his cigar from one side of his mouth to the other, then said, "You got a deal." So now we have a nativity set. French-made. Genuine plaster from Paris, the box says. We have it, if we can find it. The day I bought the nativity set was the last time I saw Wilson Roberts alive. He died the next year. We drive past his old store on our way to Thanksgiving dinner at Ruby's. The variety store is closed now. When he died, it died. Then Wal-Mart moved in, and people talk as if it's a blessing. I guarantee you WalMart won't have a 1959 edition of The Old Farmer's Almanac. Don't even bother to ask. 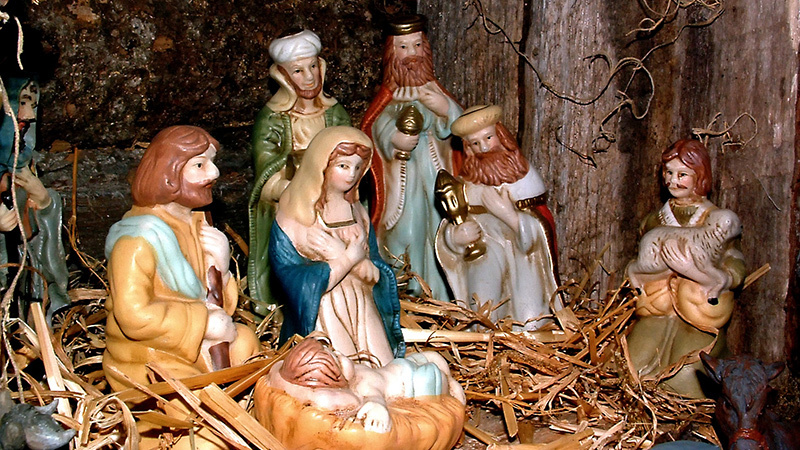 I think back on Wilson Roberts searching amid bobby pins and yard goods for the baby Jesus. Sometimes our search for the Divine has us poking around in all kinds of corners. 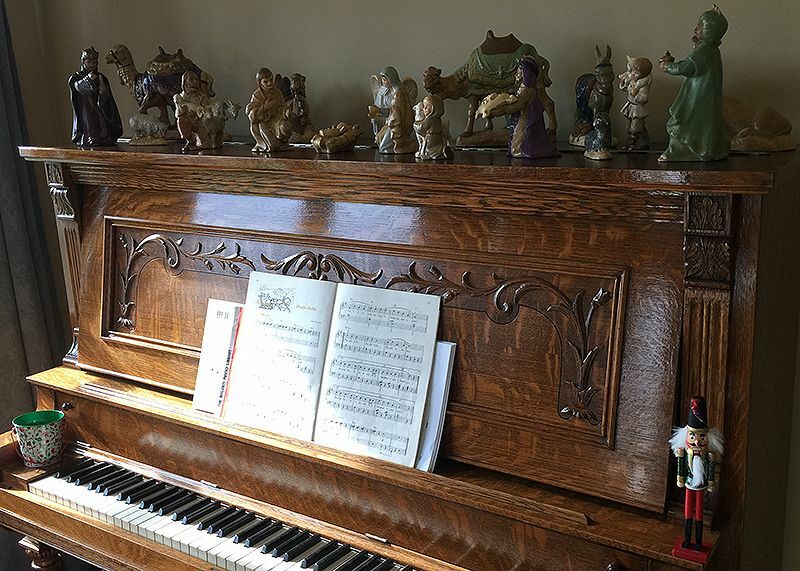 Every year at Christmas, I haul our nativity set out of storage and place it on the piano next to our front door. That way, when we're scurrying about in a frenzy, honoring the birth of the One who told us not to be anxious about anything, we can pause and remember what Christmas is all about. How that quiet baby came into this tumultuous world, greeted by wide-eyed shepherds and one-eared cows. I swing open my heart and welcome him home. This comes from a chapter in Philip Gulley's book, Home Town Tales: Recollections of Peace, Love, and Joy. © 1999 by Multnomah Pub., Used by permission. This article cannot be reprinted without the publisher's permisison. Check out more books by Philip Gulley. "Nativity Set" by Philip Gulley is licensed under a Creative Commons License. Heartlight encourages you to share this material with others in church bulletins, personal emails, and other non-commercial uses. Please see our Usage Guidelines for more information.